In my previous article, I have given different Unix commands with real-world examples. In this article, I would like to give you Tar command examples with its explanation. I would like to give you real-world Tar Command Examples so that user will get exact idea about the command. The Tar command stands for Tape Archive command. Tar command is the most used command in Linux to take tape drive backup in Unix or Linux. It is specifically used for creating, maintaining and modifying and extracting the files which are there in tar format.It gives you to quickly access a collection of files and placed them into a highly compressed archive file commonly called tarball, or tar, gzip, and bzip in Linux. In this section, I will try to explain the syntax of Tar command in Unix. I would like to give you different Tar Command Examples which gives the idea about Tar command and its usages.Tar command is mainly used to create compressed or uncompressed archive files and maintain them. I would like to explain the above syntax. 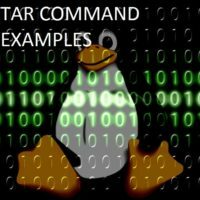 Tar Command uses different options, Before explaining Tar Command Examples I want to give you different options which are used in Tar Command. -f: This option creates the archive as per given filename in command. -z: If the user wants to create tar file using gzip this option is used. An Archive file is a file that is composed of one or more files along with metadata. Archive files are used to collect multiple data files together into a single file for easier portability and storage, or simply to compress files to use less storage space. The name of the file or name of the directory that needs to be archived. In the above section, I have explained many Tar command options. The Tar commands CVF option is a combination of options given in the above paragraph. The option c will create the archive, the option v will verbose the information and option f will create a file. The above command will create the complexsql.tar file which has all .java files in the specified directory. -c Option: This option creates the new tar archive file which contains all.java files from a directory. -v Option: This command is used to create Verbose information for tar file. -F Option: This command is used to give the new filename to the tar file. Here in the example, we have given the name as complexsql.tar. After creating the new tar file named complexsql.tar we need to check whether it is created properly or not. The output of a given command is as follows. If the user knows the file names which needs to be included in tar file then always it is better to use the different options provided by tar command like –file and –create. Let’s say the user wants to create tar file for 2 files named Complexsql1.txt and Complexsql2.txt. The user can achieve this using Tar command with its different options. Following are some examples of tar command with different options. These all commands will create the complexsql.tar file which contains the two text files Complexsql1.txt and Complexsql2.txt. If the user wants to display the list of contents of tar file without extracting it user needs to use the -tvf option of tar command. The user can zip the entire directory using -z option of Tar command. There are so many requirements where the user needs to send the entire directory. To send the entire directory user needs to create the zip file of that directory using gzip. Let’s say we need to create the zip file using gzip and tar command for the complexsql directory. The above command will create the complexsql.tar.gz using gzip directory. If the user is not working in the complexsql directory and it has some path. The user wants to create a tar file using gzip for complexsql directory situated in /etc/bin/complexsql path. The the following command is useful. The above command will create a complexsql.tar.gz file which contains different files from a directory named /etc/bin/complexsql. Sometimes there the situations where the user needs to add new files from different directories in the tar file. -r option of tar command is used to add new files in the tar file. In our example, let’s say we need to add the complexsql3.txt file. The above command will add the complexsql3.txt file to complexsql.tar file.-r the option is responsible to add the new files or append the new files in tar. Things to Remember: We can not add the new file in compressed tar file which we have created using gzip in Example no.4. We need to exclude some files or some directories while creating the tar file. –exclude option is used to exclude the bunch of files or directories while creating the tar file. Let’s say a user wants to exclude the file named complexsql3.txt while creating the tar file. The above command will create the zip file for the complexsql directory which excludes complexsql3.txt file. After creating the tar file or compressing the tar file we need to extract that tar file. There are some situations where the user needs to extract the tar files. -x option of tar command extracts the files as well as directories from the specified tar file. The above command will extract the files from complexsql.tar. Sometimes a user needs to extract the files from tar file and need to place it to the specific folder. -C option of tar command will copy all the content in the tar file and will place it to the specified folder. The above command extracts all the files and folders from the complexsql.tar file and the data placed in complexsql folder. Sometimes the user wants some specific files from the tar file. The user can extract specific file or directory from tar file with using its path. The above command will copy the file name complexsql.txt from /etc/bin/complexsql/ path and paste it to /BestWebsite/ directory. -C option use for the copying of the files and pasting it into the BestWebsite folder. There is the difference between gzip file and bz2 files. The bz2 files are less in size as compare to gzip files. Tar command provides the option to create bz2 files.bz2 compression takes more time than the compression of gz but it saves the memory.Tar command’s -j option is used to create bz2 files. The above command will create the complexsql.tar.bz2 file from the complexsql directory. The user can able to see the content from bz2 or tbz2 files without decompressing it. The decompression of bz2 and tbz2 file takes time. Using -t option of tar command user can able to check the contents of the file. The above command will list the contents of complexsql.tar.bz2 file. Once we create the bz2 and tbz2 files we need to extract the files into a specific folder. To extract the files form bz2 or tbz2 tar command has provided the option called -j. The user needs to use -x option to extract the tar files and -j option to check for bz2 or tbz2 files. The above command will extract the complexsql.tar.bz2 in the current working directory. There are so many times the user needs to schedule the backup. The user wants to schedule the backup to the particular time on daily, weekly or any time intervals. The Crone job takes the backup. The creating crone jobs are the only solution to schedule the set of commands in Unix operating system. Let’s say if we need to take backup of the complexsql folder on a daily basis user need to use the following command and for this command, we need to create crone job. The above command will create a backup of the complexsql folder on daily basis. If User wants to find out some text or some image from tar then following commands are useful. The user can achieve this using the Pipe operator with Grep command. The above example used find out the text as well as image files from tar file named complexsql.tar.
. If you really like this article or if you have some questions or concerns regarding Tar Command Examples article kindly comment it in to comment section. I hope you the Tar Command Examples article is useful to everyone.